This iPhone 4 started to glow red and smolder with dense fumes in the middle of a flight to Sydney, Australia. Fortunately, a flight attendant stopped it from exploding violently, something that has happened before with other gadgets. 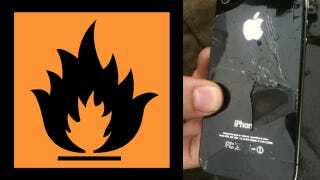 The owner of the self-combusting iPhone wasn't doing anything extraordinary with it. The iPhone's battery just started to overheat in the middle Regional Express' flight ZL319, going from Lismore to Sydney. According to the airline, the flight attendant extinguished following standard emergency procedures. Nobody was injured.